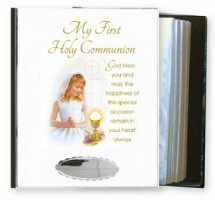 A First Holy Communion Gift is one of the most important Catholic Gifts and that is why we have carefully selected a large range of quality First Communion Gifts for the Special Occasion. Boy's Communion Metal Photo Album. Certificate - Remembrance of First Holy Communion. White First Holy Communion Gift Set with Chalice Necklace. Girls First Holy Communion Heart Rosary Beads Gift Set. Boys Blue Communion Rosette & Communion Book Gift Set. Blue Communion Rosette & Blue Communion Book Gift Set. Remembrance of my First Holy Communion Gift Set. My First Communion Gift Set - Rosary Beads, Silver Plated Crucifix & Missal. First Holy Communion Rosary Beads Gift Set. My First Missal for a Girl. My First Missal for a Girl & Communion Pen. 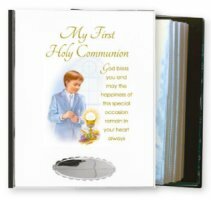 Blue Holy Communion Missal for Boy & Communion Pen. 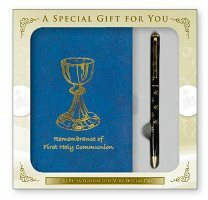 White Holy Communion Missal Book & Communion Pen. Boy's Pen with Communion Inscription & Missal Book. Girl's Pen with Communion Inscription & Missal Book. 925 Sterling Silver Volcanic Rock Rosary Beads. Metal Filigree Communion Rosary & Chalice Rosary Box. Metal Heart Communion Rosary & Chalice Rosary Box. Pewter Communion Pocket Token in a Laminated Booklet.